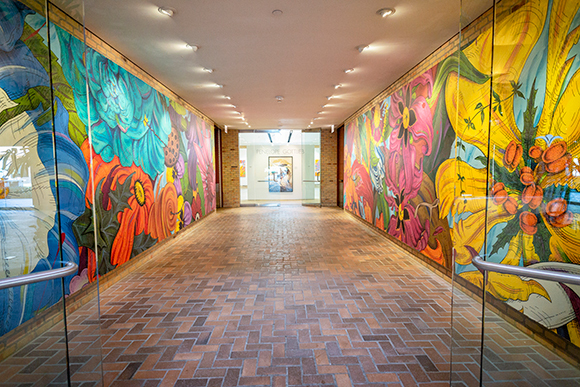 Artist Penelope Gottlieb works in vibrant colors and on large canvases, some as large as 16 feet wide. But as the name of her exhibition, Against Forgetting, at the Chicago Botanic Garden reveals, visitors need to take a close, reflective look. Her paintings address real challenges—extinction, invasive species, and vanishing plants—within the plant world. A montage of the Extinct Botanicals prints draws visitors in to the exhibition. Her interpretation of Viola cryana will be there, a plant last seen in France 90 years ago. So will Thismia americana, which hasn’t been seen for more than a century since it was found in a wet prairie along South Torrence Avenue in Chicago. Against Forgetting, a collection of about 30 works by Gottlieb, will be on display through August 12 in Joutras Gallery. Perhaps her passion was nurtured by her lush backyard garden in California or the work with her father in the family’s Hollywood Hills garden. “I have fond memories of our time together,” said Gottlieb, who earned bachelor’s and master’s degrees in art and pursued a career as an illustrator, then as a title designer for motion pictures before embracing painting and extinct plants in the ’90s. 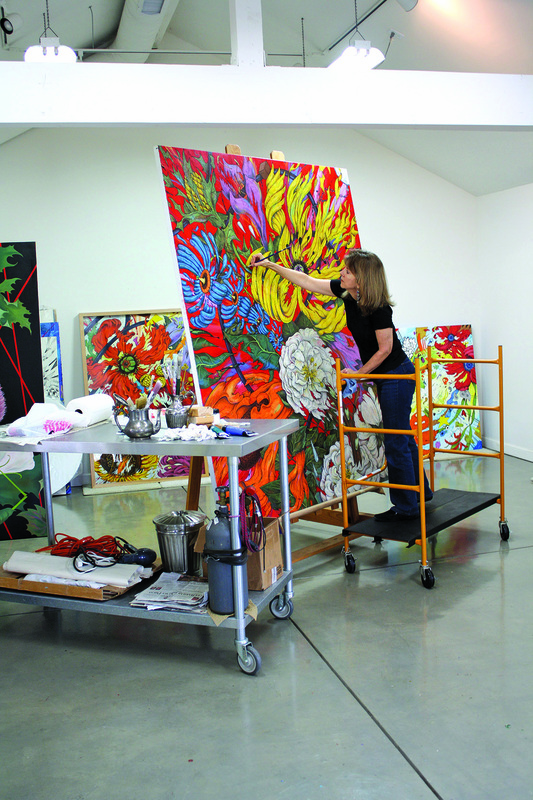 Gottlieb works on one of the Extinct Botanicals canvases in her studio. Gottlieb wanted to move beyond traditional botanic renderings. “Those were very lovely and calm. And I felt like everything was chaotic and frightening and that nature was under attack,” she added. “I needed to convey a kind of struggle.” The result was her first series, the bold, colorful Extinct Botanicals. Thrift shop botanical art prints by John James Audubon served as inspiration for her next series, Invasive Species. 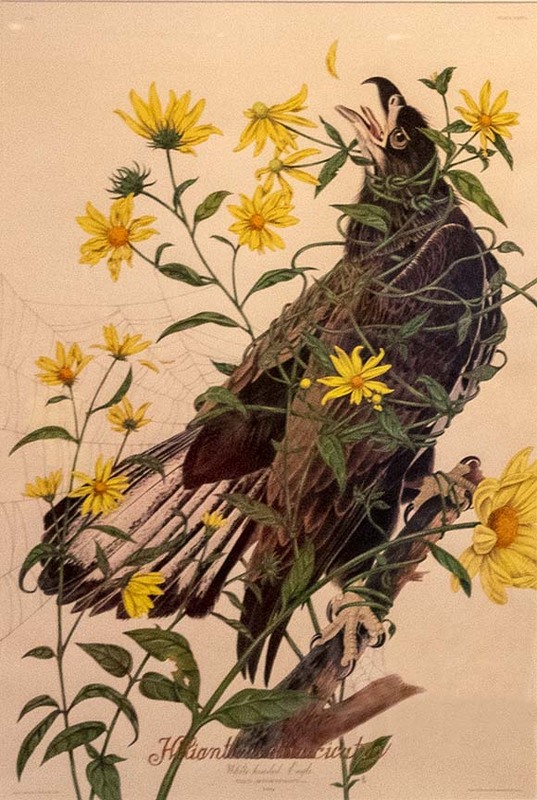 Gottlieb used reproductions of Audubon bird prints and incorporated her view of nature through plants. She designed what she wanted to paint on tissue over the pieces before actually painting on the print. “I really do like a lot of narrative in these paintings. I have a reason for all the different objects I put in,” added Gottlieb. For Hutchison, the connection to the natural world in Gottlieb works is crucial. 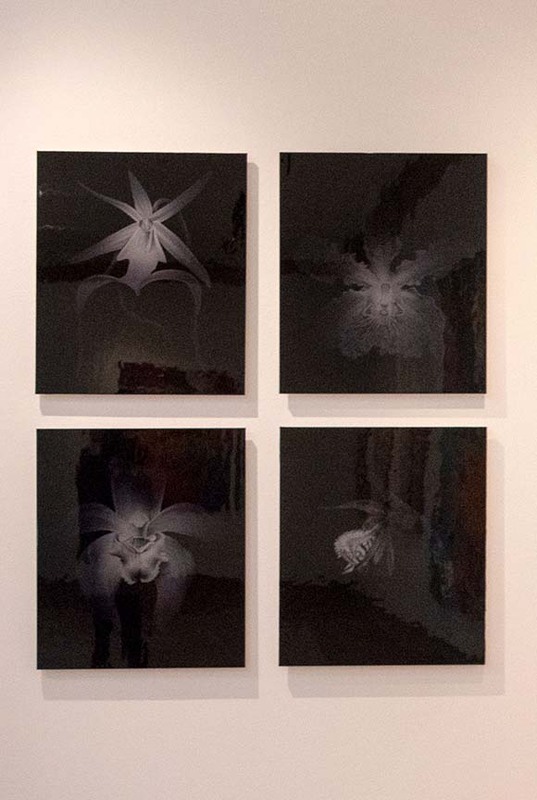 “Her exhibition does present botanicals topically and with a somewhat urgent call to concern, but the rendering, colors, and size of her works make for a powerful experience,” he said. The 30 works on display in Against Forgetting are vibrant reminders of our changing world. “I would really love it if the paintings left people with kind of a new thought or a question or something to think about when we contemplate what‘s happening to the world, to the state of nature,” she said. This post by Judy Hevrdejs originally appeared in Keep Growing, the member magazine of the Chicago Botanic Garden.